Not buying into the Greek system allows personal liberation. When I first came here as a freshman, I had two goals for my college experience: get good grades and join a fraternity. I chose Dartmouth because I wanted the exceptional undergraduate education it offered. Outside the classroom, though, I just wanted a place where I could relax, maybe drink some beer and hang out with friends. I’m happy to say that I accomplished that first goal. With guidance and support from family, friends and faculty members, I was encouraged to take a wide range of courses and pursue my intellectual interests. With this freedom to move around and explore different topics, I thrived academically. While the academic aspect of Dartmouth has proven itself to be positive, I have not accomplished the second goal and have instead ended up outside of the Greek system. Although I rushed, I never felt invested in joining a particular fraternity. I wanted social mobility in the same sense that I had academic mobility: I wanted to be able to meet new groups of people who had different interests and develop my own interests as a result. However, because I did not form strong friendships with a group of brothers, I did not end up receiving a bid. Yet this rejection has given me the opportunity to continue pursuing my Dartmouth education both inside and outside the classroom. I can explore different academic and social interests, and as a result, grow as a student and a person. I admit that fraternities definitely have perks. With almost two-thirds of upperclass students affiliated with Greek life, I feel somewhat ostracized without a house to call home. Additionally, fraternities offer a specific place where you can go and feel comfortable around everybody. Although I often relax with my roommate and our friends in my dorm and have become involved in a couple of clubs, part of me wishes I had a more definite community on campus. Yet at the same time, I worry that fraternities by nature inhibit people from exploring what really interests them. When I set foot in fraternity basements, I often get the sense that all that bonds brothers together is a mutual affinity for sucking cheap beer out of orange cans. While you might know brothers from classes you’ve taken together or from clubs you’ve both joined, becoming a member of a fraternity does not depend on joint interest in one subject. 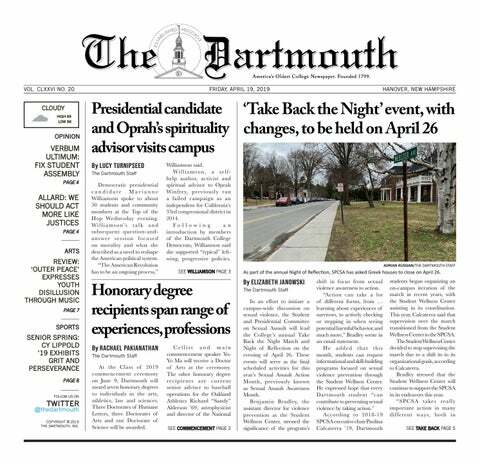 If you’re in the Dartmouth Outing Club or write for The Dartmouth like I do, you know that other members either like climbing mountains or writing. In a frat, you might have nothing in common with your brothers. During a competitive rush process, I often felt like a monkey forced to act out a more interesting, outgoing and artificial version of myself so that certain people liked me. During mandatory pre-rush meetings, the Greek Leadership Council often told me that frats would not make me feel uncomfortable and that I should feel free to be myself within the Greek system. But when I had to get to know a bunch of brothers and try to make them like me so they would give me a bid, I naturally had to put aside some of my own interests. In conversations, I had to talk about music or movies or TV — topics that I could talk about with brothers, many of whom I had little else in common with. In that sense, I felt myself buying into a certain type of institutional groupthink, wanting to echo the house culture. Rather than fostering my interests, I found the Greek system stifling. Since I am not a brother anywhere, I have a lot of free time on my hands. This, however, does have some downsides. I have to self-enterprise and look on my own for things to do. Since the Greek system is such a dominant presence on campus, most of the people I know or meet are busy as new members. On the other hand, I have the opportunity to explore my own interests, and don’t have to spend all my time getting drunk with the same people in the same place four nights a week. While Dartmouth has always given me academic freedom to explore my interests, I now feel like I have social freedom and am able to do what I want when I want. Not joining the Greek system has given me the liberty to be myself.